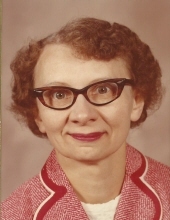 Irene Kern, age 94 of Hendricks, MN passed away on Saturday, March 23, 2019 at the Hendricks Nursing Home. Mass of Christian Burial will be at 10:30am on Thursday, March 28th at Ss. Peter & Paul Catholic Church in Ivanhoe. Visitation will be held one hour prior to the service at the church. Burial will take place at the St. Leo Catholic Church Cemetery in St. Leo, MN. Houseman Funeral Home is entrusted with the arrangements. Irene Leona Kern was born on November 24, 1924 to Ernest and Josephine (Chovitek) Kern on the farm near Taunton, MN. She was Baptized, Confirmed and received her First Holy Communion at the St. Leo Catholic Church in St. Leo, MN. She attended St. Leo Parochial school and then moved to Marshall and worked in a restaurant for 45 years where she was known for her famous doughnuts. After retirement Irene moved to Ivanhoe and then moved to the Hendricks Nursing Home where she resided for the past nine years. She was a member of Ss. Peter & Paul Catholic Church in Ivanhoe. In her spare time, she enjoyed reading. Irene suffered for many years with asthma and diabetes. She is survived by her brother, Milo (Loretta) Kern of Minneota, MN and her sister, Marie (Stanley) Gorecki of Hendricks, MN and numerous nieces, nephews and cousins. She is preceded in death by her parents; five brothers: Aloysius, Arnold, Cyril, Raymond and Virgil Kern and two sisters: Barbara and Leona Kern. To plant a tree in memory of Irene Leona Kern, please visit our Tribute Store. "Email Address" would like to share the life celebration of Irene Leona Kern. Click on the "link" to go to share a favorite memory or leave a condolence message for the family.